“A healthy woman is much like a wolf – strong life force, life-giving, territorially aware, intuitive and loyal. Yet separation from her wildish nature causes a woman to become meager, anxious, and fearful. With the wild nature as ally and teacher, we see not through two eyes only, but through the many eyes of intuition. With intuition we are like the starry night, we gaze at the world through a thousand eyes. The wild nature carries the medicine for all things. She carries stories, dreams, words and songs. She carries everything a woman needs to be and know. She is the essence of the female soul. It does not mean to lose one’s primary socializations. It means quite the opposite. The wild nature has a vast integrity to it. It means to establish territory, to find one’s pack, to be in one’s body with certainty and pride, to speak and act in one’s behalf, to be alert, and to find what one belongs to. It means to rise with dignity, to proceed as a powerful being who is friendly but never tame. 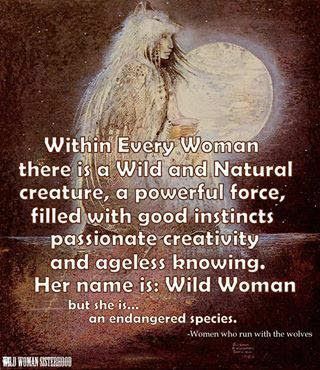 The Wild Woman is the one who thunders in the face of injustice. She is the one who keeps a woman going when she thinks she’s done for. She is intuition, far-seer, deep listener, and she is loyal heart. She thrives on fresh site, and self-integrity. “Women who run with the wolves” is a classic book for any wildish woman looking for new stories and myths of femininity. Having my own connection to wolves, this was one of the first books I grabbed when I begun my embodiment quest. I was still at university and lapped up the dense-poetic prose as a wonderful contrast to the scientific papers (not to mention bullet point self-help books). Clarissa’s book holds a dear place in my heart, I remember reading it with a sense of wonder – to find someone who recognised and validated the sense of inner-wolf-creature I’d had my whole life. It was the first time the link between inner wildness and mental health had ever been suggested to me. It was also the first book to introduce to me the idea of healing myths, archtypes and the wisdom held in stories. Reading this book was like a remembering : of a time long ago before the written word, let alone the internet. The way to pass down key information on how to live was to encode it stories, and then through an oral tradition of tale-telling, keep that information alive across generations. In the book, Clarrissa shares specific stories for women to help them understand more about their natures, relationships, and life. She takes a traditional tale, then goes into it in depth, explaining the symbolisms and meaning. But it is more than a collection of stories, it is a story-account in it’s own right, with Clarissa guiding you into the territory of your inner wild-poetic soul. I remember getting completely engrossed, reading it avidly almost as if I was a wolf following a scent trail. But I also remember the forest-book getting denser and denser and eventually giving up somewhere towards the end. Everybody I’ve met who has read this book shares a similar story – if you’ve read the whole thing, I’d love to hear from you! “Wild Women who Run with the Wolves” is definitely on my return-to list, but it is a book to be given time and space to really take in and consider. I am very grateful to have found this book at a relatively young age, it shaped my twenties by giving me permission to be wild, free and trust my instincts. Do you ever dream of a life of travel and adventure? To just pack a suitcase, leave work and rent obligations behind and live in multiple countries across the globe? This was my life for a year – out of a mix of necessity and choice in order to be with my Canadian husband. We lived in Germany – on the edge of the Black Forest, various places in Italy, California, Canada. Beautiful, magical parts of the world. Better than the London basement I’d been in before. 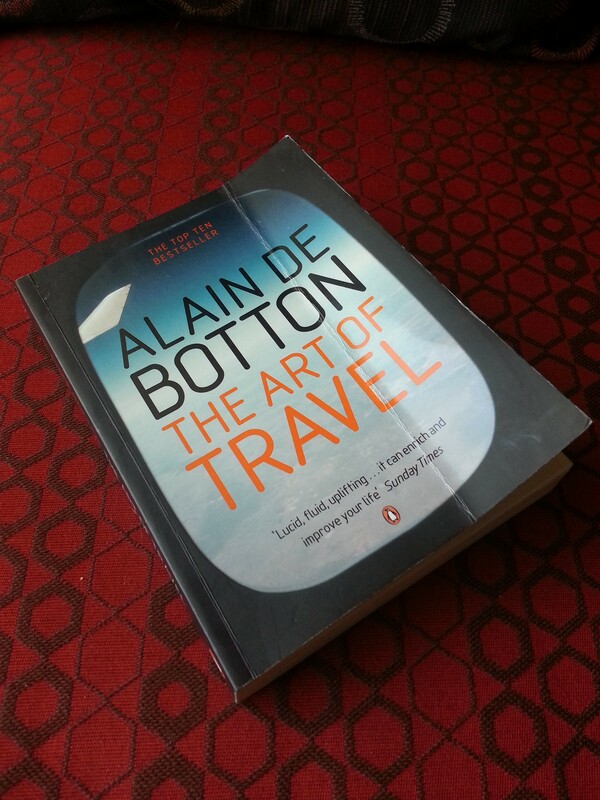 So one day whilst staying a week in Bath Spa, I saw a book by Alain De Botton – The Art of Travel. Good reviews, nice picture, and best of all small enough to pack in my bag without adding much in the way of extra weight. Since then it has been in said bag the last few months as I’ve moved about, getting creased and worn. Finally, back in Sacramento California, I take it out and start reading. I agree – not only is this an enjoyable read with well written prose, but Alain cuts straight into the reality of the traveling experience. It turns out that no matter where you go, you still have to be with yourself! He mixes accounts of his own story with references to artists, philosophers and other writers. The book is split into different episodes and themes, which makes it perfect for carrying in your hand luggage and taking it out for brief reads on the train or waiting at aiports. For myself, having a companion with me as I grapple with learning the “art of travel” is both soothing and inspiring. However I consider this book equally relevant for anyone who has ever traveled or simply yearns to do so. It is so easy to think that it is the external surroundings that give us our happiness and explain our moods. That our problems stem from the basement flat, rainy country, painful shoulder, bad relationship, lack of money and time, diet (or lack of diet!). It’s easy to delay our happiness and excuse our misery. My own traveling life has certainly given me a lot of evidence that no matter the climate, location, activity – it is the inner world, the relationship with yourself, that creates our experience of being. Small changes in our sense of self, the habits of our minds, the awareness of our bodies – these can have dramatic effects on our capacity to take in, savour, and find satisfaction in the world around us. (Such changes are also cheaper than package holidays – and accessible to everyone!). We don’t need to go far away or change everything in order to feel better in ourselves. The “Art of Travel” is as much about how we approach our daily life as it is having grand adventures. I recommend it for it’s rich insight mixed with amusing and very honest exploration of being human no matter where we are.